What are they doing …. ? … and how do statistical institutions present what they do? In times of fake news and austerity measures, statistical offices are feeling more and more the urge to orientate the public about themselves and the usefulness and necessity of trustworthy statistics. Public relations specialists know countless ways to get messages to the target groups. A traditional and usually quite boring way are annual reports. They’re usually just an obligatory thing and treated accordingly. Is this still a quite boring lecture under the changing circumstances mentioned above? Let’s look at a few examples. The European Statistical Governance Advisory Board publishes the report, which focuses on fake news and trust issues. It’s mainly a control report with recommendations to be re-evaluated next year. Not everyone’s reading but with some interesting facts about the European statistical infrastructure. ‘ … this year’s Report focuses on the importance of good governance to maintain and increase trust in official statistics, ensuring appropriate access to administrative and privately-held data, and the practical challenges of coordinating NSSs. Chapter 1 looks first at the challenge of maintaining and enhancing trust in official statistics when there is conflicting information provided by non-official sources or when statistical indicators fail to relate to citizens’ actual experiences. Access to administrative records and privately-held data is then examined, highlighting some of the difficulties encountered by NSIs and the need to ensure that the transposition of the new Regulation on General Data Protection into national law does not hinder access to data for statistical purposes. Finally, the challenge of coordination within NSSs is discussed, particularly in relation to ONAs. Chapter 2 provides ESGAB’s overview of the implementation of the Code of Practice, ..
national statistical authorities and Eurostat. …. and the quality of European statistics …..
(NSIs) and Other National Authorities (ONAs) …. UK is of a similar type to the EU. Somewhat more systematic, with clear performance targets and evaluated indicators …. and tons of financial data. Sweden reports concisely on a few central goals and with the obligatory information on the organisation and infrastructure. – The report shows not only the activities of the Office, but also the state of the country according to various topics (the milestones of the multi-annual statistical programme, and at the same time a small Statistical Yearbook). – And it is very personal, responsible persons behind the statistics become visible. Germany is taking a quite different approach: the annual report is more like a scientific magazine. With interviews and contributions to focal topics. I hope that all of the other topics dealt with in this report provide you with a good insight into all matters figure-related and that, in so doing, we can enhance your trust and confidence in official statistics.’ (Dieter Sarreither, p.3). Annual reports are certainly not the most effective way of informing the public about the activities and importance of statistical institutions. They must be approached with other measures; they must be embedded in PR measures. Then they can – especially if they are well made – contribute a lot to understanding official statistics. The Best Presentation Award of the International Marketing and Output Database Conference IMAODBC 2016 in Gozd Martuljek, Slovenia goes to Susanne Hagenkort-Rieger and her team from DESTATIS (Statistisches Bundesamt, Germany). In her presentation Susanne highlighted the importance of web search statistics and why intuition when emphasizing selected statistical data is often not sufficient. To achieve relevance and accessibility of most popular statistical data we should not ignore what the web search data say. How to find out user needs? Which method to choose? ‘The most important category is the basic needs. Basic needs are taken for granted and they are typically unspoken. If they are fulﬁlled, they do not increase satisfaction. If they are not fulﬁlled, they will cause dissatisfaction. c) Young multipliers (young graduates and PhD students of social and economic sciences). ‘Target groups were asked for their basic needs and delighters concerning data search, data use and the reporting process. ‘Most important basic needs and delighters: Especially for the responding enterprises it is a basic need important to get survey results after the survey is completed. A telephone service is a basic need especially for the bigger companies and the households to support the reporting process. 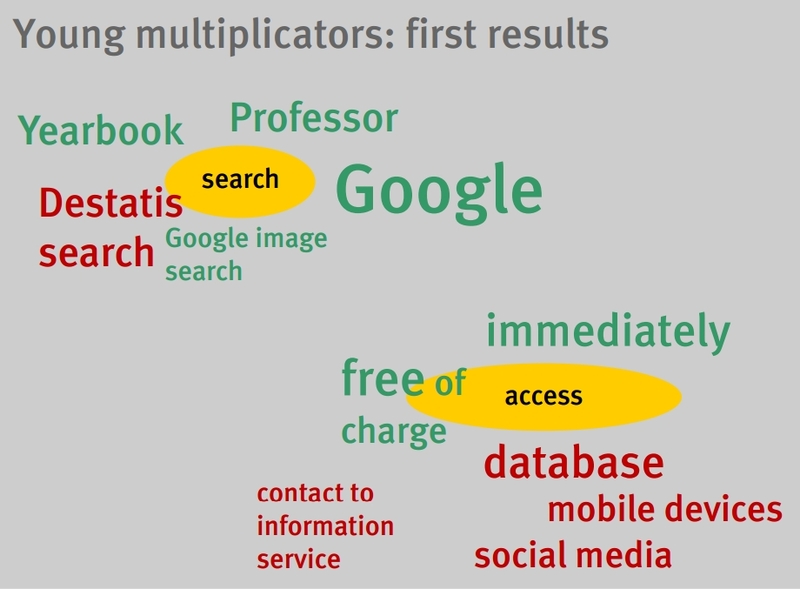 Most important basic needs and delighters: Fast multipliers expect more than databases and datasets. For almost every second a telephone-support is a basic need. This is quite interesting because there are many internal discussions at Destatis to give up that service for the journalists. Also they expect to ﬁnd data they are looking for as fast as possible and for free on the internet. After an average of 14 minutes of searching on the Destatis website they will contact the information service if they are not able to ﬁnd what they are looking for. To satisfy their basic need to ﬁnd data as quick as possible we have to improve the search engine. Today Destatis released a new projection of Germany’s population by 2060 accompanied by an all new animated population pyramid. It is the first population pyramid that really moves upwards. In case the above doesn’t display in your preferred language, here are the distinct links for english, french, spanish, russian, german. The pasted screenshot is the mobile version you will automatically see on small screens. There is much more to explore on larger displays, as birthyears are labeled directly, you can lock an outline for comparison and there are four different variants to choose from, so that you can judge the outcome with different assumptions. Apart from starting the animation with the (Play) button you can navigate through the years by mousewheel, left/right cursor keys or on touch devices directly by swiping up or down on the pyramid. A month ago ONS did an excellent job in hosting The Graphical Web 2014 conference in Winchester/UK under the theme “Visual Storytelling”. You should check the summary at the conference website and go from there. It was a great event to meet people from a variety of backgrounds, e.g. 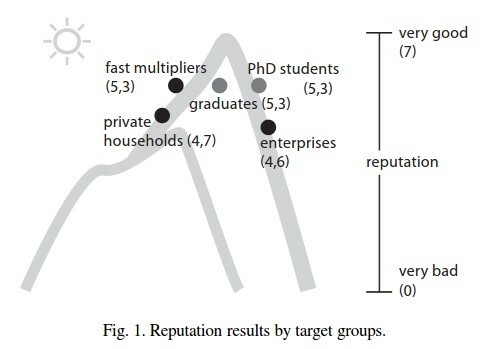 academia, the media and of course NSIs (Statistics Norway, Statistics Austria to name just a few). I guess we’ll be talking about this conference for a while and there are many presentations worth watching already posted. For example Alan Smith from the ONS shows us why learning to programm graphics is a worthwhile endeavour for statisticians who wouldn’t regard themselves as programmers. His presentation discusses the practicalities of developing that capability in house as a key part of the corporate skills agenda. It borrows heavily from examples and lessons learned from the 7 year lifespan of the ONS Data Visualisation Centre. The Best-Presentation Award of the International Marketing and Output Database Conference IMAODBC 2013 in Neuchâtel/Switzerland goes to Ilka Willand from the German Federal Statistical Office destatis. 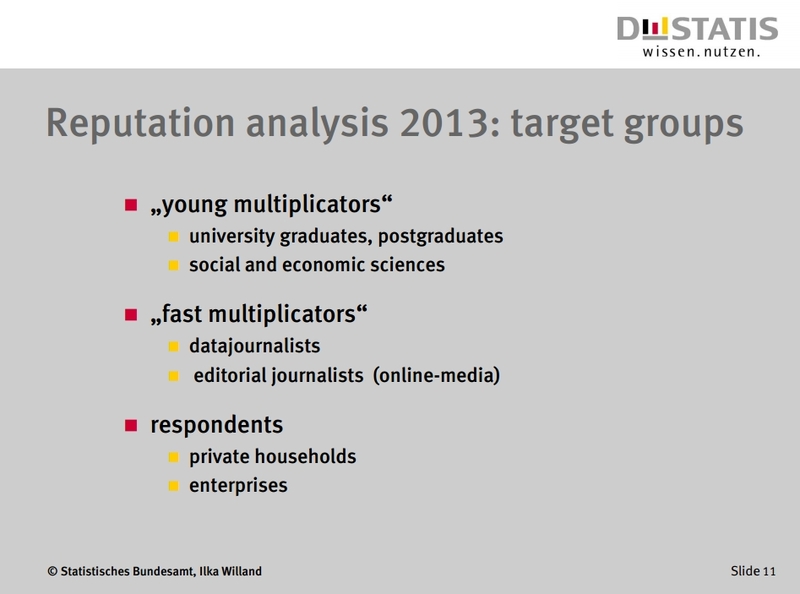 Ilka presented the reputation analysis 2013 of destatis which aims at getting information about target groups for statistical information – also the ones not reached (yet). First results of the not yet finished survey show how these groups search statistical information and how they want to access this information (green: preferred behaviour, red: not preferred behaviour). The Berliner Morgenpost (Julius Troeger) presents a visually beautiful example of network analysis. It’s the twitter traffic of 61 members of the Berlin parliament with people outside the parliament . The 61 members were in contact with 3000 users (blue points) and sent 60000 tweets. Persons (blue points) in the middle of the graph had the most intensive contact with the members of parliament (orange, green, black according to party membership). It’s an interesting example of datajournalism. 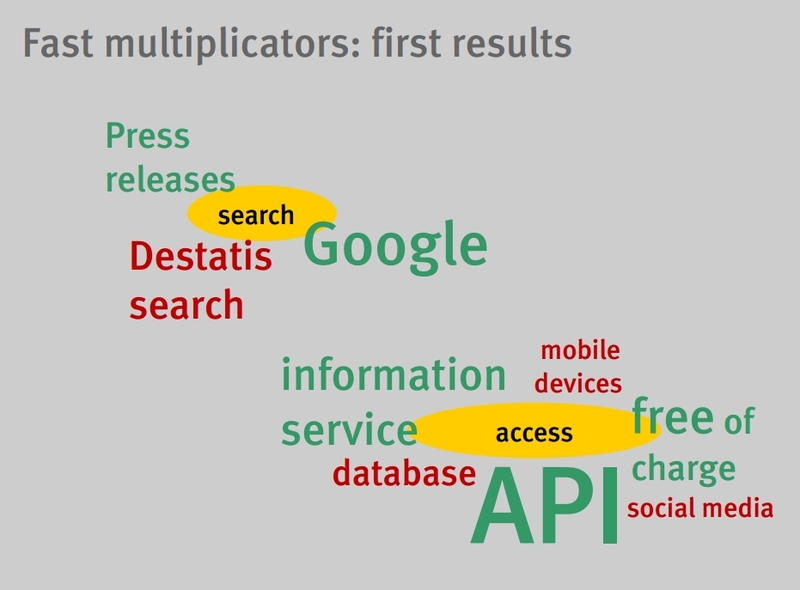 But it’s far from giving qualitative insights: Which topics are hot? Which impacts has this use of short-message communication on forming opinions and decisions? A huge field! An open source tool for network analysis is gephi, ‘a tool for people that have to explore and understand graphs …. a complementary tool to traditional statistics, as visual thinking with interactive interfaces is now recognized to facilitate reasoning‘. It’s not often (if ever) used in official statistics where network analysis is not very frequent (true? ).